Easy. Cheesy. Wonderful. Grilled Cheese. Who doesn’t love a wonderful grilled cheese? It’s America’s sandwich. But don’t settle for just any ole grilled cheese. Spice it up by adding endless ingredients to make yours delicious and unique. We’ve put together a list of the five best grilled cheese joints in Dallas who do just that. And I promise, once you get your hands on one of these bad boys, you’ll never look at a grilled cheese the same way again. This place is home to every mouthwatering grilled cheese you can possibly imagine. Dallas Grilled Company can satisfy your sweet tooth with a Grilled PB&J or shock your taste buds with the Buffalo Chicken Grilled Cheese. If this is your first visit to the restaurant, follow the wise words ‘Go Big or Go Home’ and order the BBQ Short Rib Mac ‘N Grilled Cheese. 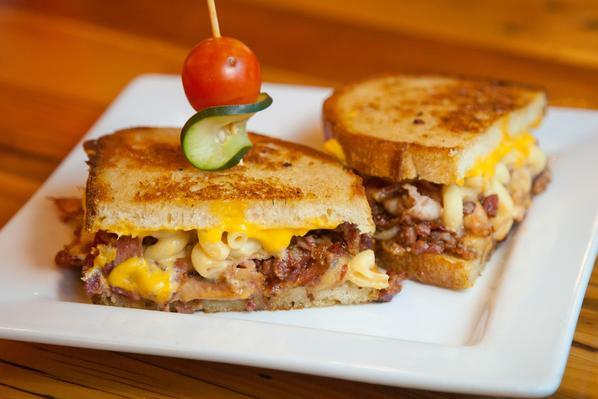 This king of a sandwich holds smoked short rib, house-made BBQ sauce, smoked Gouda, and American mac and cheese between two pieces of grilled white bread. Its southern flavors will leave you stuffed and only wanting to come back for more, but no matter what you choose to order you can’t go wrong. 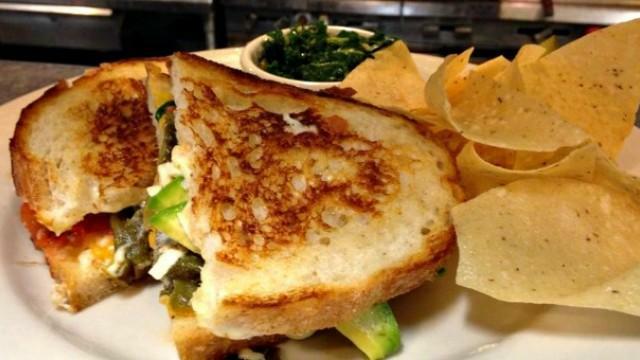 All of you spicy lovers out there, head on over to AllGood Café and order the Grilled Cheese with Green Chiles. This smokin’ hot sandwich will make your taste buds sweat. Layered between two pieces of sourdough are cheddar and pepper jack cheeses, roasted green chiles and Roma tomatoes with chipotle and mayonnaise. Even if this sandwich causes tears to run down your face, you just can’t stop going in for another bite. As Ruthie says, “So Good It’ll Make You Squeal” and it couldn’t be truer. If you’re lucky enough to track down this adorable pink and blue food truck, you must order their staple menu item, The Boss. 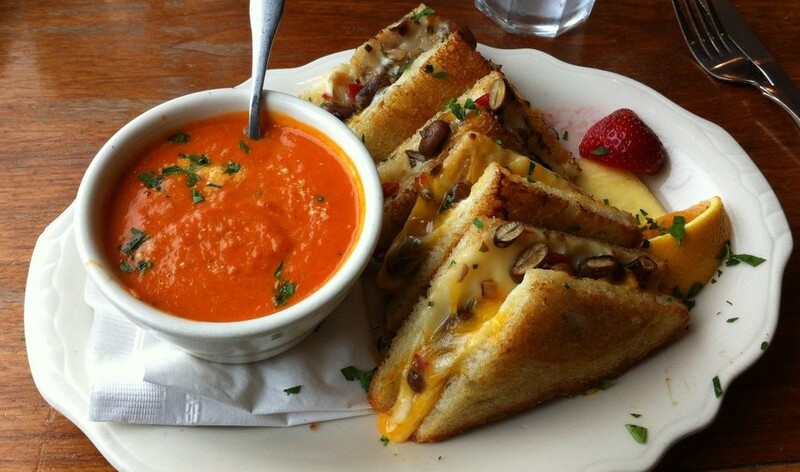 This unbelievable grilled cheese was voted as one of the “Top 10 Dishes” in Dallas by D Magazine. 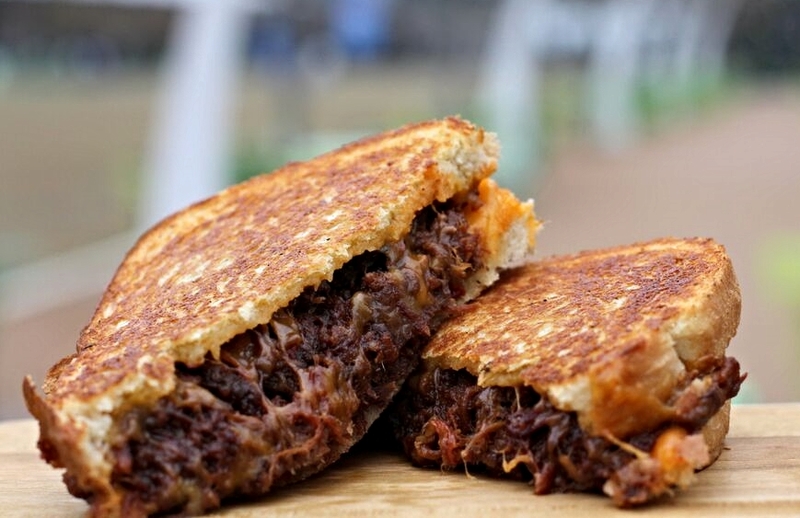 The Boss overflows with mouthwatering brisket and melted cheddar cheese on sourdough. It’s so addictive you might find the need to check yourself into Ruthie Rehab. Want a great environment to hang out in but still devour a delicious grilled cheese? Social House is the place to be. Their homemade grilled cheese is nothing ordinary. This piece of food artwork consists of white cheddar, American and Swiss cheese, piled with granny smith apples and prosciutto on sourdough bread (FOMO? Make a similar sammich at home). But it doesn’t stop there. The dish also comes with a side of tomato soup and your choice of fries or chips. Lucky’s is a destination stop for many visiting Dallas and a local treasure for the ones who call Dallas home. This cozy diner has been around since 1986 and so has their tasty ‘Sleaziest Cheesiest.’ Who knows how it got its name, all that matters is it tastes great. Tillamook sharp cheddar and Brazos valley cheddar cheese melts over tomato and applewood smoked bacon on jalapeño cheddar bread. Pair this Sleaziest Cheesiest with their signature lemonade and you will have a lunch that you will never forget. Need a quiet place to relax, dive into a good book, or study? La Madeleine is the french cafe waiting for you. This cafe is known for its delicious homemade pastries, desserts, and soups. 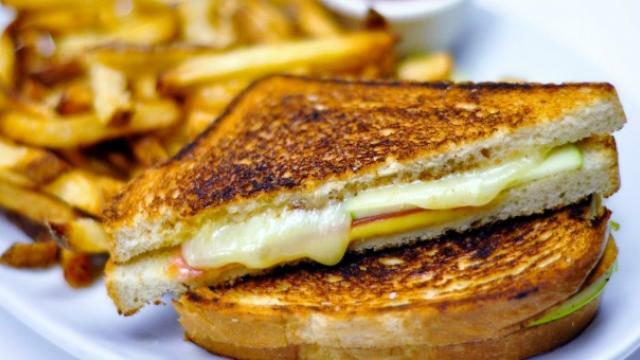 However, their mouthwatering Croque Monsieur is one of the best grilled cheeses in the Dallas area. 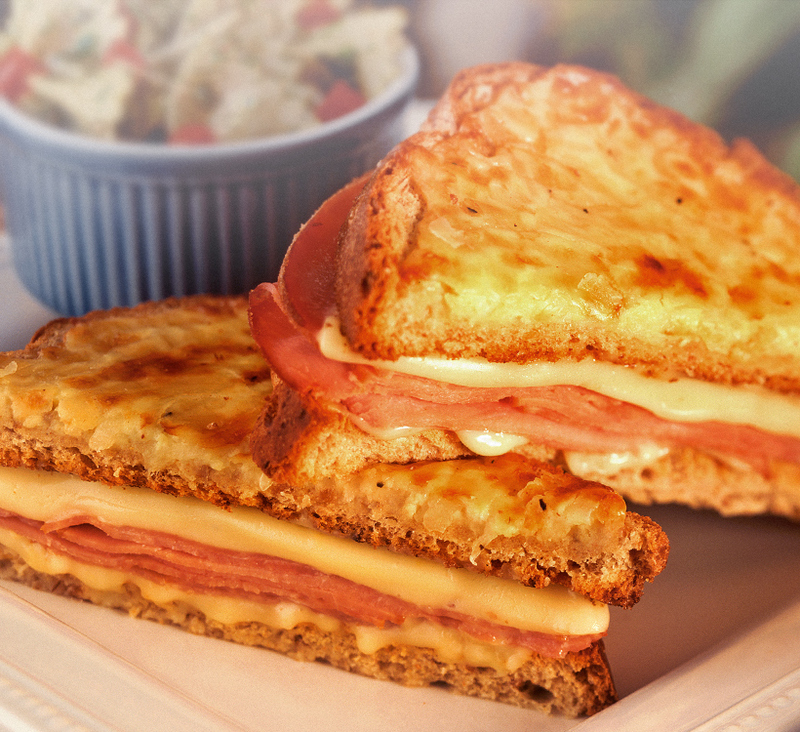 The Croque Monsieur is oven baked until the toast is crisp, and ham and cheese are melted perfectly. As they recommend: dip it in a cup up of their homemade tomato basil soup. Last but certainly not least, the flavorful Shiitake Grilled Cheese by renowned Chef Brian Duffy. CBD Provisions is located in the heart of Dallas’ downtown and attracts a lunch crowd from all over. Their grilled cheese is only offered on the lunch menu but its unique taste will make you crave it for any meal. 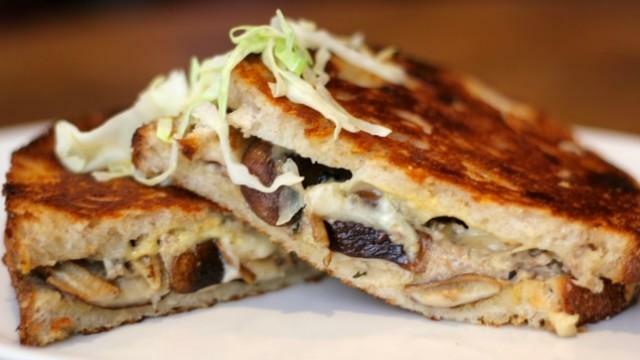 The Shiitake Grilled Cheese is filled with homemade sauerkraut, layers of gruyere and finely chopped mushrooms for a savory and smooth taste.